Exam fears are normal, but excessive stress can overwhelm students. 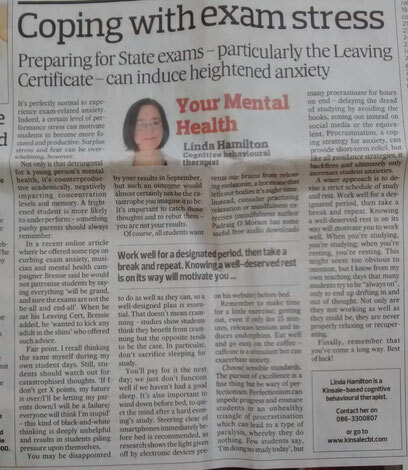 Last week's Southern Star column offered some tips for students on how to cope with exam stress. The column is reproduced below. Exam season is upon us. Preparing for State exams – particularly the much-hyped Leaving Certificate – can induce heightened anxiety. It’s perfectly normal to experience exam-related anxiety. Indeed, a certain level of performance stress can motivate students to become more focused and productive. Surplus stress and fear can be overwhelming, however. Not only is that detrimental for a young person’s mental health, it’s counterproductive academically, negatively impacting concentration levels and memory. A frightened student is more likely to underperform – something pushy parents should always remember. Fair point. I recall thinking the same myself during my own student days. Still, students should watch out for catastrophised thoughts. “If I don’t get X points, my future is over/I’ll be letting my parents down/I will be a failure/everyone will think I’m stupid” – this kind of black-and-white thinking is deeply unhelpful and results in students piling pressure upon themselves. You may be disappointed by your results in September, but such an outcome would almost certainly not be the catastrophe you imagine it to be. It’s important to catch those thoughts and to rebut them – you are not your results. Of course, all students want to do as well as they can, so a well-designed plan is essential. That doesn’t mean cramming – studies show students think they benefit from cramming but the opposite tends to be the case. In particular, don’t sacrifice sleeping for study. You’ll pay for it the next day; we just don’t function well if we haven’t had a good sleep. It’s also important to wind down before bed, to quiet the mind after a hard evening’s study. Steering clear of smartphones immediately before bed is recommended, as research shows the light given off by electronic devices prevents our brains from releasing melatonin, a hormone that tells our bodies it's night-time. Instead, consider practising relaxation or mindfulness exercises (mindfulness author Padraig O Morain has some useful free audio downloads on his website) before bed. Make time for a little exercise; getting out, even if only for 15 minutes, releases tension and induces endorphins. Eat well and go easy on the coffee – caffeine is a stimulant but can exacerbate anxiety. Choose sensible standards. The pursuit of excellence is a fine thing but be wary of perfectionism. Perfectionism can impede progress and ensnare students in an unhealthy triangle of procrastination which can lead to a type of paralysis, whereby they do nothing. Few students say, “I’m doing no study today”, but many procrastinate for hours on end – delaying the dread of studying by avoiding the books, zoning out instead on social media or the equivalent. Procrastination, a coping strategy for anxiety, can provide short-term relief, but like all avoidance strategies, it backfires and ultimately only increases student anxieties. A wiser approach is to devise a strict schedule of study and rest. Work well for a designated period, then take a break; rinse and repeat. Knowing a well-deserved rest is on its way will motivate you to work well. When you’re studying, you’re studying; when you’re resting, you’re resting. This might seem too obvious to mention, but I know from my own teaching days that many students try to be “always on”, only to end up drifting in and out of thought. Not only are they not working as well as they could be, they are never properly relaxing or recuperating. Finally, remember that you've come a long way. Best of luck!